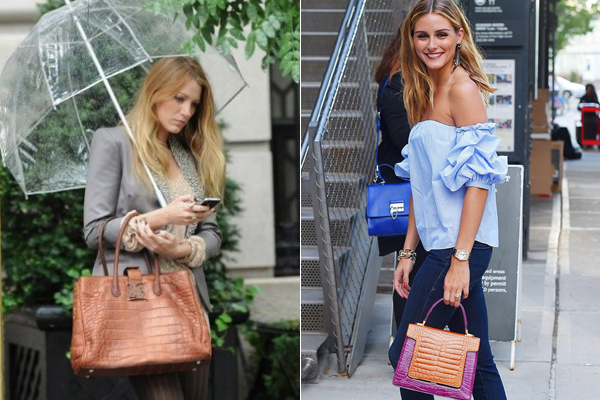 Blake Lively and Olivia Palermo with Analeena creations. Celebrity hand bag designer brand Analeena will make GCC debut at My Wedding Party, set to be held in Bahrain in March 2017. The collection is exclusively stocked in Harrods, the MC Market in Monaco and Paparazzi Boutique in Azerbaijan. My Wedding Party is the GCC’s one-stop-shop fashion extravaganza focusing on the wedding sector. The event that takes place from the March 15 to 18 at the Bahrain International Exhibition and Convention Centre. Analeena’s signature multi-hued exotic-skin collections is described as a work of art executed with the use of the finest cured exotic skins in a unique blend of colours and “built” by the best of Italian craftsmanship. Analeena’s lead designer and brand founder is Lina Hamed, a fashion graduate from the University of Westminster. She started her career as a buyer for Hermes in Paris as well as nurturing her talents by co -designing exotic-skinned saddles for the high-end brand. She also worked as an assistant designer to Stephen Rolland at Jean Louis Scherrer before launching her own line of luxury handbags, ball gowns and accessories in 2008. “I look forward to exhibiting at My Wedding Party and meet with our existing clients in the region and to showcase some of the latest collection that recently debuted in Paris” added Hamed. Analeena has positioned itself as one of the world’s ultimate fashion accessories for luxury, quality and design innovation. Analeena handbags and ball gowns have been worn by A-List celebrities, royalty and political figures all around the world. “My Wedding Party provides a sneak peek into Analeena’s 2018 collection. Analeena is known to many of the GCC visitors to London during their shopping trips to Harrods,” said Jubran Abdulrahman, managing director of the organisers HCE. “We’re hoping that designer Lina Hamed’s presence at the show will also inspire the younger generation of Bahraini talents to reach for the stars,” added Abdulrahman. “My Wedding Party supports Bahrain Tourism’s drive to promote the island as a wedding destination by highlighting the products and services available in the region and Bahrain. Thus enhancing Bahrain’s claims to be a holistic venue to arrange weddings,“ said Ahmed Suleiman, exhibition director.